The short answer is, of course, zero per-cent. and it has come back with passages and paragraphs brightly coloured. The highlighted sections indicate text for which the software has found matches, on the internet or within its own databases. Highlighted text does NOT indicate plagiarism. If the highlighted text is inside quotation marks, is indented, or in some other way makes clear that this is somebody else’s words or work, and if there is indication as to whose words or work it is, then it is not plagiarism. It is a match, but it is a match used in academically acceptable style, with no suggestion that the writer is trying to pass this off as his (or her) own. ASIDE: There are other ways of indicating the use of someone else’s words and work, so some judgement is needed. In-text citation (or numbered foot- or end-notes) and bibliographic references are requirements of academic writing (as well as the quotation marks or other signals for exact-word quotations). But in fiction, in journalism, in writing for a general audience, there are other ways to show indebtedness to others; in sound and in visual works, there are other ways to show indebtedness to others. They should still be used, one should still honestly state what is not one’s own; it’s just that it does not have to be indicated in pukka MLA, APA, or any other style! If the highlighted text is a bibliographical reference to a book or journal or website or any other source (and these are often flagged by Turnitin because someone else has likely used the same source material), it is not plagiarism. If the highlighted text is a common expression, it is not plagiarism. Many subjects have stock expressions. And what about “The constitution of the United States of America…”? That’s eight consecutive words. Turnitin will highlight expressions like this. It is not plagiarism. Similarly, it is usually held that there is no need to document the source of common knowledge, nor common knowledge within a subject. There is no need to document it – but Turnitin may still highlight it. How much matched text is allowed? That is a different question, and that depends on the nature of the exercise, how much other people’s work is needed in the discussion of what one wants to say. But text matches per se, cited and signalled, that is not plagiarism. It should also be noted here, non-highlighted text does NOT necessarily indicate that there is no plagiarism. If a reader is suspicious, is sure that this could not be the writer’s own creation, then further investigation is needed. It is relatively easy to beat Turnitin – but that is a matter for another post. Much of the time, fortunately, and one would like to think most if not all of the time, there is no intent to cheat. The writer wants to do an honest piece of work – and does. But, say it again, Turnitin does not detect plagiarism – it detects matches of text. Turnitin says as much, on its website, and in much of the supporting material available through the website. Turnitin has long since made claimed that it is an educational site, its purpose is not to catch plagiarists but to help writers source their material appropriately. It offers other services as well which aim to improve the quality of student writing and to ease the teacher’s load. In recent months, it has begun concentrating, not just on student use of unoriginal material but on the worthiness and authority of the sources of that unoriginal material. The aim – the claim – is better, improved, more-scholarly writing. Which is why I get just a little suspicious of websites which claim to help writers determine if their work includes plagiarism. There is no such thing as plagiarism detection software, the human touch is always needed. My advice, and I know it is idealistic, is that students should learn WHY they should document their sources, WHY and WHEN, and that they get plenty of practice so they get into the habit. Practice which allows them to make mistakes, and to learn from their mistakes, and no mention of the “P-word”. Perfecting the HOWs, the formal formatting styles, come later. If they know WHY and WHEN they need to cite and reference other people’s work and they do it, they shouldn’t need text-matching checkers, they will have the confidence to know they are doing it right, using other people’s work ethically and honestly. And the earlier they start, the better! Not all the sites which offer online plagiarism detection services are free. And it doesn’t matter how much such services cost – they cannot detect plagiarism. Automated sites might find matches, but it takes the human touch to determine whether the matches are evidence of plagiarism or not. Which, final point in this post, just makes it a teensy bit ironic that iThenticate, the parent company of Turnitin, time after time after time, states, on its web-site and in its documents, that it offers online plagiarism detection software? And that leads one to wonder, somewhat tongue-in-cheek and with the start of this post in mind, how much plagiarism confusion is allowed? But the basic question, how much plagiarism is allowed? Answer, “None”! This entry was posted in Academic honesty, Turnitin.com and tagged iThenticate, statistics, surveys, text-matching software by John Royce. Bookmark the permalink. i submitted by course work on turnitin with a high percentage of 21 percent, i would need an advice to confirm if may actions could get me in trouble or my result been withheld, i would be glad to hear fro you. Mike, as I say in this post, it depends. How much is left? In each case, ask yourself, is the flagging legitimate, should there be a citation there, acknowledging authorship? Should there be quotation marks? Have you tried paraphrasing someone’s work but stayed too close to the original? If you have used your own words, have you still indicated the original author? If there is anything left, how much is still flagged/ in doubt? Ask yourself if you really did come up with these words, thoughts, ideas – or if you might have been influenced by what you have read? If nothing is left, if all flagged text can be seen as legitimate, you should have no worries – and should be able to defend yourself if accusations are made. 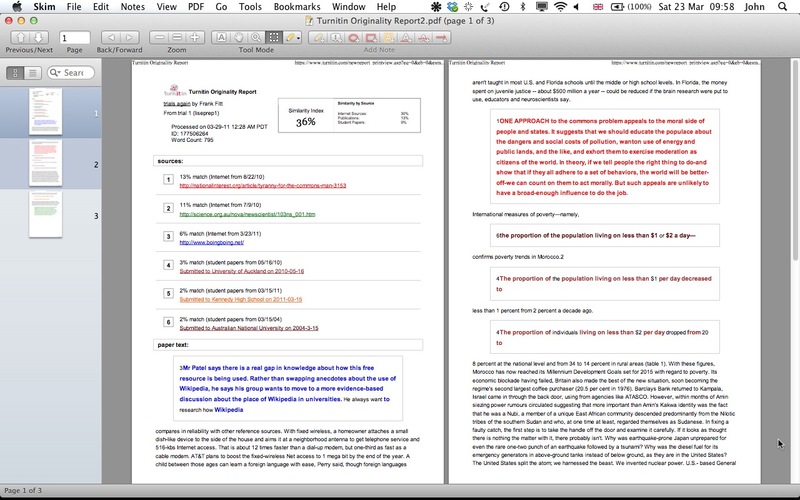 If there is still flagged text remaining and it turns out that you did use someone else’s words or ideas without citation or quotation marks, the decision as to whether you are in trouble or not, whether your result is withheld, may depend on the stage at which you submitted your work to Turnitin. If that was the complete and final work – and your school allows no further editing or changes, there is no going back, you must accept the consequences. If this was a draft and changes are still allowed, then there should be no consequences as long as you make any necessary adjustments. (If this is the case, discuss if necessary with your instructor what you did “wrong” (if there is anything wrong), how better to use the text, how better to cite the material. I am panicking, because I forgot to include in-text citations, so my turn-it-in results were pretty bad. But this is only for the first draft. The consequences are so severe for a first draft! They’ll even tell my university about it. Do you think it’s okay? I think there are two issues here. I will deal with them in turn. The first is the punishment and the consequences. Yours is an IB DP school – and IB’s general rule is that work is not complete until you have signed off on your work and submit it for assessment. When you sign off, you put your signature under a statement one sentence of which reads “I have acknowledged each use of the words, graphics or ideas of another person, whether written, oral or visual.” But until you have signed off and submitted, IB leaves it to schools to deal with any problems or issues. Your school deals with issues and with “misconduct” according to its own rules and policies. Once you have signed off and submitted, you become subject to IB rules and policies, perhaps in addition to your school’s rules too. That varies from school to school. Some schools are very strict about what happens if Turnitin finds matches, especially if this is not the first time you have been “caught.” Ideally, there is a sliding scale of offence and punishment, so that a first offence is not treated as harshly as a third or sixth offence. Ideally, offenders are given the opportunity to learn from their mistakes – not just opportunity to correct their mistakes but also investigation of what went wrong and explanation as to why it is wrong and how to “write right”. Other schools are more lenient, and often require that students put their drafts (and final submissions) through Turnitin AND put right any mistakes they might have made BEFORE they give the draft or final essay to their teachers. Turnitin reports are seen as opportunities for you to learn from your mistakes and to put them right, without punishment or consequence. If students here fail to attend to genuine issues flagged by Turnitin, then it is their own fault if consequences follow. As I say in the blog, Turnitin often gets it wrong; you may have done everything needed to show that this is not your work. So if you are not sure why Turnitin has flagged part of your work, do ask. What is the position in your school? How is Turnitin used? As this was your first draft and not a submission, IB is not involved; your school’s rules are the ones which matter. That said, telling your university that you have plagiarised on your first draft does seem a very harsh consequence, unless you have a serious record of plagiarism and/or other misconduct – in which case this should have been noted on your university recommendations even without this incident? The other issue is, WHY – HOW – did you forget your in-text citations? All of them? Or just some? Or is this due to the way you make your notes and the way that you write? Is it your notemaking that is at fault, an uncertainty as to what are your own thoughts and interpretations of what you read, uncertainty as to what are other people’s thoughts, other people’s exact words? I don’t think this is your problem, not from your letter, but if it does apply, do try writing and organising your notes better, more completely. Or do you write your essay and then go through looking for words and sentences which need an in-text citation and add it as an afterthought? From your letter, it sounds as if this is the way that you write – or in the case of your draft, didn’t. This could well be the lesson you need to learn, HOW to write. It’s a matter of honesty, but it is also a matter of good practice. I am also wondering, did you have quotation marks around your quotations? Were the sources you used included in your bibliography? If your essay had been submitted to IB as complete, these might be mitigating factors and lighten IB’s consequences for your lack of in-text citation. I hope that your school does NOT inform your university that you made mistakes in attribution in a draft piece of work (I prefer “mistakes in attribution” to “plagiarism”, in this instance, it is far less damning). That is a harsh consequence – unless, as I say, you are a habitual and deliberate offender, and I don’t think you’d be writing to me if you were. I hope you have learned the lesson, several lessons, from this incident – and you should know that the consequences at university level could be extremely hard, no second chance. You might also want to show this letter to your DP coordinator and college counsellor, and respectfully ask them to reconsider their decision if they intend to go ahead. Turn it in does not work. Easy to manipulate.